You know what they say: if it's worth saying, it's worth saying loudly. Or, we think people should say that. While we had cheerleader costumes in mind when we first posted this megaphone. But we can think of a lot more interesting ideas for making loud mischief. After all, there's nothing your neighbors will like more than hearing, "give me 'T', give me an 'R', give me an 'I'. . . and onwards until Trick-or-treat is spelled. When you've got spirit like that, the neighborhood is sure to bring out their king-sized candy bars that you've always known they had stashed away. 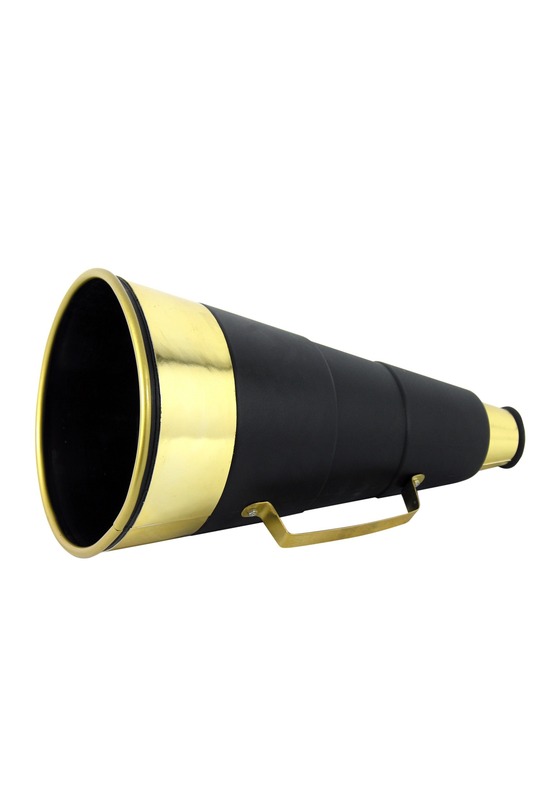 While there are no complicated mechanics hidden on the inside of this sharp black and gold megaphone, your voice will be heard nice and loud simply due to the science of physics. The flat black surface is accented with a shiny gold framing the wide trumpet, the mouthpiece, and the handle. The color scheme makes this accessory stand out and the handle makes it easy to hold while announcing whatever you have in mind. Sometimes you've got to stand up and put your hands together for the home team. Your team might be struggling or maybe they're headed straight to state. Maybe you didn't even make the cheer team. No matter what, you're sure to love shouting it out with this stunning megaphone!